Francis Blundon was born in Loudoun County, Virginia on April 14, 1867. The son of contractor John V. and Fannie (Nolan) Blundon, Francis was educated in the public schools, and served as an apprentice and journeyman in carpentry for about eight years thereafter. He then started independent work as a builder, erecting approximately 700 houses in Washington, DC during the first ten years of his career alone. His successful commercial ventures included building the Virginia Flats for Joseph R. Portner, one of the first apartment houses in the city. Many of his projects were done in partnership with his brother, Joseph A. Blundon who lived in his father’s house at 3219 O Street in Georgetown. On January 5, 1893, Blundon married Mamie Schenable, who had been born in August of 1873 in Virginia. They had two sons together, Francis Edward (b. Jan 31, 1894) and Victor Sylvester (b. Feb 7, 1896) that eventually became salesmen in their father’s real estate business. Some of examples of Blundon’s developments in Washington include the seven homes from 1408 to 1420 Hopkins Place, NW built in 1896, six homes between 2817 and 2827 13th Street, NW and 1228-1230 Harvard Street, NW built in 1904, and three at 2019-35 13th Street, NW, built in 1911. 100 W Street seen in 2011, sans the clay tile roof. 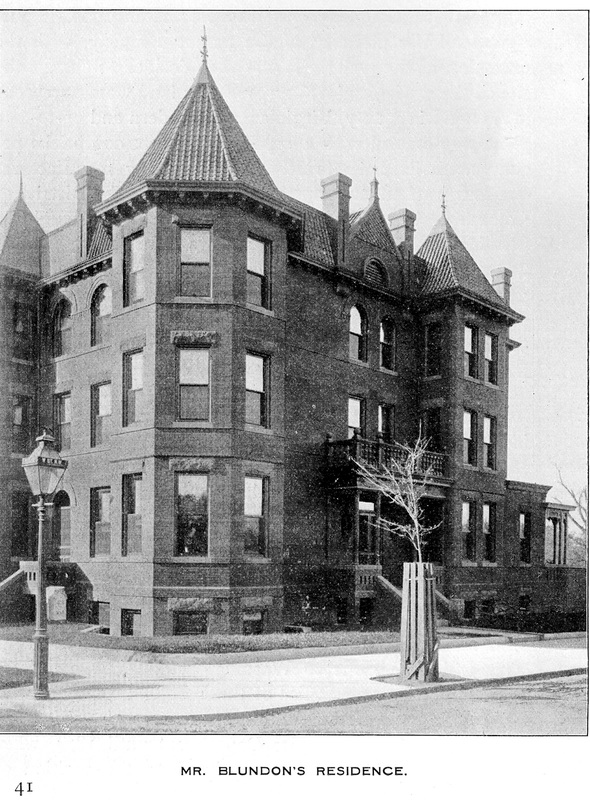 The Blundon family lived in his own designed and built house at 100 W Street, NW, illustrated here about 1902. In June of that year, he sold the adjoining four houses for an impressive $23,000. The Blundon family had moved there from a house located close-by at 67 S Street, NW. His brother Robert, a salesman in the real estate business joined them at the house in 1910, according to the census. That year, Blundon had a live-in black chauffeur named Frank R. Payner, age 23, and a live-in black cook named Hattie Clement, then age 30. The house was later home to the Soul Saving Center Church of God until 2011. Early in his career, Blundon maintained an office at 1220 G Street, NW, and joined with partners Abin G. Belt and Robert Lee O’Brien in a construction firm coined Blundon, O’Brian & Belt, Inc., specializing in “real estate, loans, and insurance.” At the time, Belt resided at 3117 13th Street, NW and O’Brian at 439 Rhode Island Avenue, NW. where the Finmark Americana condominium building stands today. Francis Blundon died in 1939. The house was later sold by a subsequent owner on July 18, 1946 to John O. and Jeannette P. Harris. They moved to Washington, DC from Mount Sterling, Kentucky, where John indicated that he was a physician by profession, and she a public school teacher. Both had been born in Washington, DC, however, in 1898 and 1902, respectively. They had a daughter named Gwendolyn who had been born in Washington, DC about 1926, and later, a son named Richard. The 1930 census record for the Harris family lists them as black. He began his medical career in 1926, although it is unknown where he obtained his medical degree. Harris made local and national headlines in April of 1953 when he was held in the death of Arlington, Virginia socialite Josephine Fuller’s death due to an abortion. The April 9, 1953 edition of Jet magazine carried the headline “Dr. 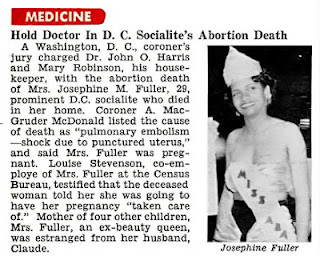 John O. Harris Held in Washington DC Socialite Josephine Fuller's Abortion Death,” with the brief article reproduced above. She had died on March 22, 1953, with both Harris and his housekeeper, Mary Robinson, in attendance. A Grand Jury held both individuals on March 26, 1953, with the official charged entered on April 28th of that year only against Dr. Harris. On June 3, 1955, Harris was ordered by District Judge Edward Tamm to serve 3 to ten years imprisonment for the operation and revoked his medical license for the illegal operation. “Real Estate Market,” Washington Post, June 1, 1902. Victor died while on a cruise in Costa Rica in June of 1936. I love this house! 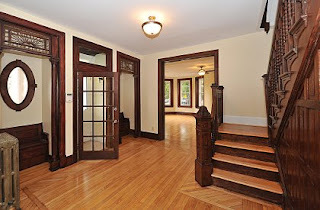 Sad to see that developers today have little or no talent at combining modern renovations with past preservation. Except for the staircase in this historic home, everything was replaced with bad home-depot renovations and white vinal windows. Thankfully, word is that the new owner has taste, respect for history, and hopes to spiff this house up again, while paying tribute to its past. I wish more developers had talent, taste and respect.